Classical pianist Ludovico Einaudi, the most-streamed classical artist of all time, has announced a new worldwide deal with Decca Records. After nearly 15 years and six album releases together, Decca will now release the Italian composer’s music globally. Einaudi’s career spans over 30 years but recently he has amassed a huge following of young fans and an incredible two billion streams, currently adding an average million a day. His last album Elements, released in 2015, saw him become the first classical composer to reach the Top 15 of the Official UK Album Charts in over 20 years. 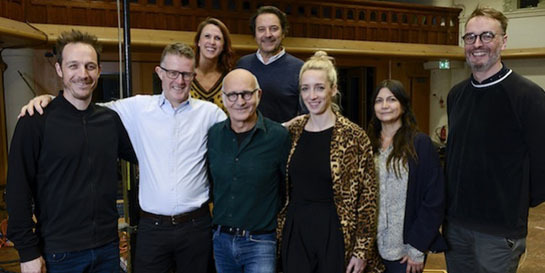 Einaudi’s latest project was inspired by winter walks in the Alps in 2018. Written in his signature impressionistic style, Seven Days Walking will see seven bodies of music released over seven consecutive months, the first – Seven Days Walking: Day One - being made available this week. Seven Days Walking: Day One is Einaudi’s 14th studio album. The release of Seven Days: Day Two is to follow in April then each ‘day’ will be released digitally a month apart, leading up to the release of Day Seven in autumn in a box-set of the complete Seven Days. The collection of albums reflects seven variations of the same imaginary journey retraced at seven different times. Ahead of the first release, the team at Decca organised a listening preview for key stakeholders and media contacts in the form of a free yoga session with Bodyism at 4PS, Universal Music’s UK HQ. Einaudi is playing two shows at the Union Chapel in Islington on March 28 and 29, both of which sold out in record time. These will be followed by further UK dates as part of an extensive global tour that will be announced soon.